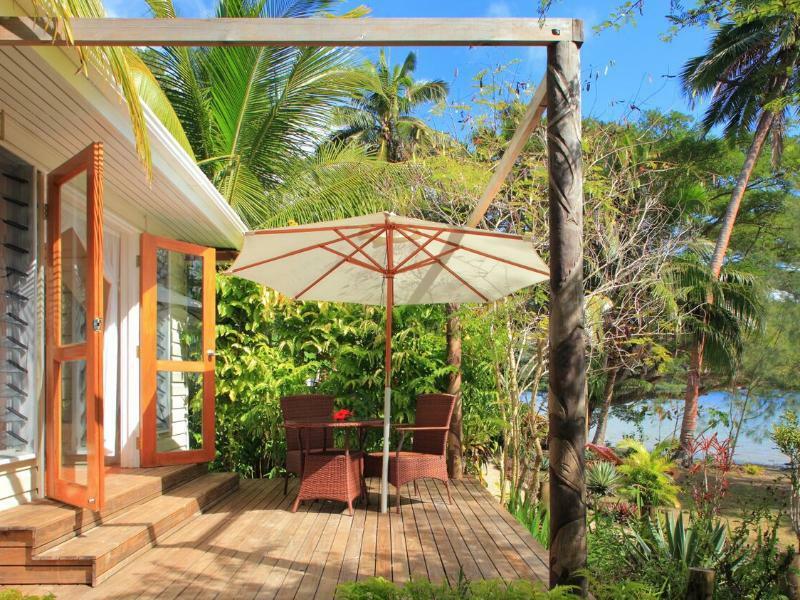 يشكل Sau Bay Fiji Retreat - off Taveuni بموقعه الممتاز في المدينة نقطة انطلاق جيدة لاستكشاف أفضل ما فيها من معالم ومناطق نابضة بالحياة. يسهل الوصول إلى هذا الفندق ذو 4 نجوم من المطار، فهو يبعد عنه مسافة 20 km فقط. إن سهولة الوصول من الفندق إلى المعالم السياحية الشهيرة الكثيرة في المدينة هو استثنائي بحد ذاته. إن الخدمات الممتازة وحسن الضيافة العالي في Sau Bay Fiji Retreat - off Taveuni تجعل إقامتك تجربة لا تنسى. يمكن الاستمتاع بمجموعة من الخدمات على أعلى المستويات في الفندق كمثل واي فاي مجاني في جميع الغرف, خدمات بريدية, خدمة سيارات الأجرة, خدمة التنظيف يوميًا, أمن على مدار 24 ساعة. 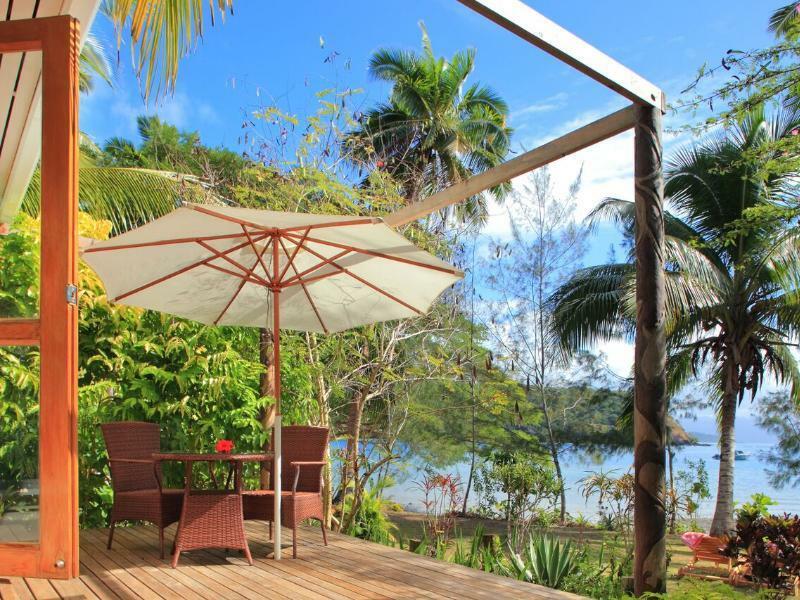 في Sau Bay Fiji Retreat - off Taveuni غرف نوم يزيد عددها عن 6 صممت بذوق وعناية لتوفر لك كل وسائل الراحة . بعضها يحتوي أيضاً على تلفزيون بشاشة مسطحة, قهوة فورية مجانية, شاي مجاني, بياضات, مناشف. يقدم الفندق مجموعة واسعة من وسائل الراحة المتنوعة، كمثل: كنو, الغوص السطحي, تأجير معدات الرياضات المائية, مسارات المشي, شاطئ خاص. إن Sau Bay Fiji Retreat - off Taveuni هو مكان مثالي للمسافرين الذين يتطلعون إلى الراحة والاستجمام في المدينة. يوجد تكييف هواء بتكلفة إضافية. يجب دفع قيمة خطة الوجبات المطلوبة في العقار مباشرةً. تتضمن خطة الوجبات الكاملة 3 وجبات يومية (إفطار كامل/ غداء من طبقين وسلطة/عشاء من 3 أطباق) أو خطة وجبات خفيفة (إفطار تروبيكال/ غداء من طبق واحد/عشاء من ثلاثة أطباق). انتقالات المركبات من ناتوفو (في فانوا ليفو) أو بالقرب وايفو (في تافينو) يتم ترتيبها عبر العقار، ويتم تسديد قيمتها إلى العقار. ينظم العقار انتقالات بالتاكسي من لاباسا أو سافوسفو أو العقارات الأخرى في فانوا ليفو إلى ناتوفو - يجب تسديد قيمته مباشرةً إلى التاكسي. يوفر العقار انتقالات بالتاكسي من مطار تافيوني و أي عقارات أخرى في تافيوني إلى رصيف تافيوني - تُسدد قيمة المبلغ إلى التاكسي مباشرة. ملاحظة مهمة: يجب أن يتم إعلام العقار قبيل الوصول بثلاثة أيام على الأقل بالتالي: مواعيد الوصول والتواريخ والموقع؛ وذلك كي يتم تنسيق انتقالات التاكسي أو القارب. It was all perfect, beautiful, welcoming, good food, great diving and manta rays. The only thing was the final bill, bigger than we could pay. The owner understood we weren't a high budget couple, and gave us a discount, and we are very grateful, a reasonable person. However, I think it was an exception. Ask for all prices before booking. If you have no budget issue is a perfect location for romantic and adventure travel. This is the place to come for true rest and relaxation. You can do as much or as little as you please with the usual activities on offer. 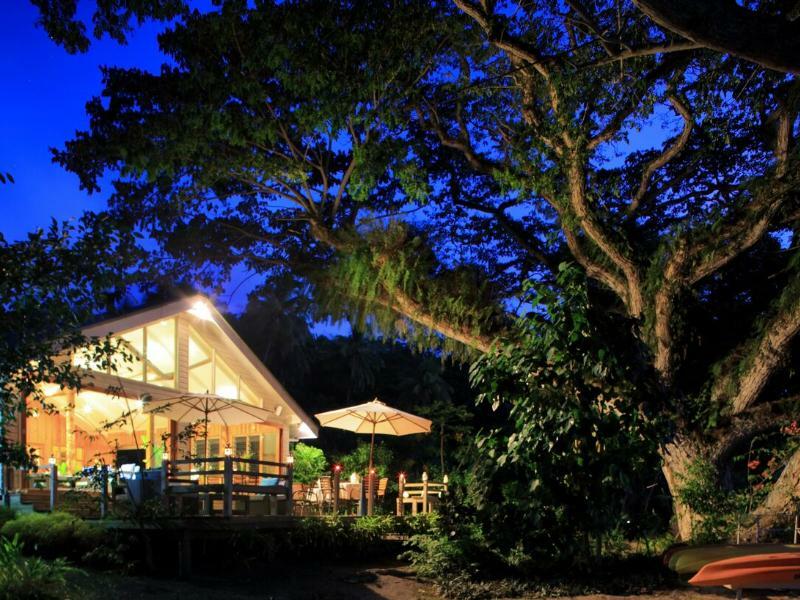 The resort is small ,rustic and it is somewhat of an adventure to get there! The quiet connection to nature is blissful - imagine sitting in a hammock with the gentle waves lapping at your feet and the island dogs sleeping next to you for companionship. I read 4 books in 5 days - a measure of how peaceful I felt. Kayaking through the mangrove forest to see the mudskippers was an experience....especially with the dogs Missy and Blue swimming alongside us. Bera treated me to 2 amazing massages in the spa hut - fell asleep both times to the gentle sound of the waves in the bay. I cannot say enough about the kind and friendly staff...they truly make the place feel like home. I am very grateful that we decided to venture to this little piece of Paradise.! We had a really relaxing time at Sau Bay. Worth the extra effort to get there. Lovely surroundings and staff were excellent, friendly and helpful, no job too small. Food was delicious and plentiful, and loved that we could choose our own mealtimes. There's a only small number of guests which makes for lots of peace and quiet! We especially enjoyed a day trip out on the boat to snorkel and have a bbq picnic on the beach. There are several dogs who are very friendly but if you really don't like dogs this place may not be for you. We didn't mind them as we like dogs though. Thanks for a great holiday! Our experience at Sau Bay was one for the books! Sera and team took such great care of us and was incredibly accommodating. As a couple who dive, we felt absolutely spoiled by the world-class diving, just a short boat ride away. Carl, the awesome divemaster, will take you to the best sites - we highly recommend the Great White Wall. Not a diver? All good! There are heaps of activities to keep you busy; sailing, snorkeling, paddle boarding, kayaking, etc. as well as plenty of relaxing nooks where you can unwind. The meals far exceeded expectations and the beautifully appointed cottage was spotless. We especially loved the daily fresh tropical flowers (thanks, Bera!). We can't wait to return! Thanks all, we miss you already! 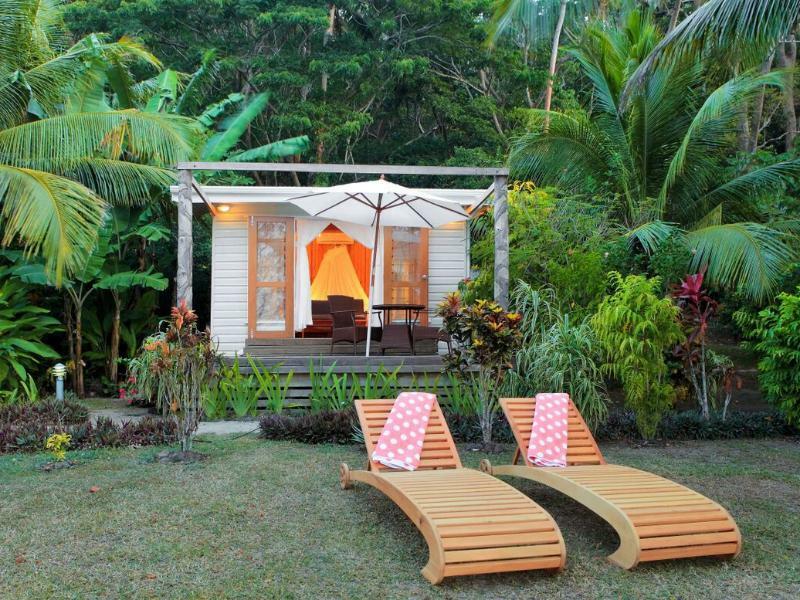 A beautiful little retreat in a protected bay surrounded by lush forest. Access to several sites for snorkelling / diving. The staff are wonderful, from the time you are greeted on arrival you are looked after like one of the family. The whole resort is presented beautifully. A short and picturesque boat transfer from Taveuni. Would recommend to anyone. Beautiful, small resort in a wonderful location. The staff are extremely attentive, friendly and make sure your stay will be great. The small size means that staff and guests will soon know each other better and gives the whole experience a personal touch. Food was delicious and often locally sourced from the garden or home made (bread, jam, fruits, baked goods, etc). They were also very careful to meet dietary requirements and often double-checked. Food was always delicious and plentiful (light meal plan was enough). The bures were very nice, well maintained, not too close to each other so there was plenty privacy. Everything was very clean and generally done to a high standard. Diving was amazing! Carl and Kim did a fantastic job of looking after us. The dive sites are beautiful, offer huge diversity, many fish, beautiful corals and great visibility (15-25m). There's always towels, fruit, snacks and even hot tea/coffee on board which was much appreciated! Definitely recommended! Sau Bay is one of the nicest resorts I've ever stayed at and hosts Carol and Nigel, are the most accommodating we have ever had the pleasure of meeting. Beautiful water, gorgeous reefs and lovely rooms made this the ideal vacation spot. with only 12 to 15 guests you have all the privacy you could hope for, yet enough mingling at meals and adventures to maximize your enjoyment. Snorkeling, Diving, Fishing are the biggest draw with paddle-boards, kayaks and sail boats are all available at no charge. Everything was great at this hotel - careful staff, delicious food and especially home-made cookies from Bera, perfect rooms and especially wonderful smell of tangerines at outdoor shower, magic atmosphere, stunning views from the top of mountaines behind the resort and absolutely magic and friendly dogs! I highly recommend Sau Bay and have not stopped talking about it since our return. The location is secluded and truly stunning we did not see anyone else our whole trip who did not work for Carol or Nigel. 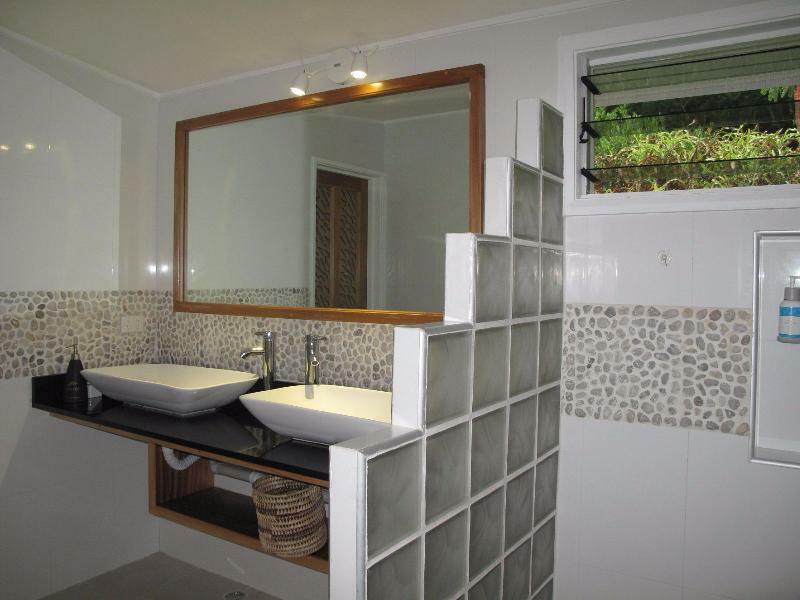 The Cottages were well thought out, separate tea/coffee fridge area, walkthrough wardrobe area, large bathroom with separate toilet and to top it off a private outdoor shower with clothes line for your beach gear which can be accessed by the side of the cottage. Bedding linen is 5 star quality, quilted top on mattress, quality linen and pillows even a turn down service at night. The location is ideal if you like snorkelling and going out on day trips to reefs. Staff are friendly, attentive and always smiling, it's a place where you feel welcomed........Thank you Nigel, Vika, Sowani and Sio) I recommend having a massage in the spa hut, it's open breezy with a beautiful view over the bay Will return! Friendly, great food, world-class snorkeling in the Rainbow Reef with outstanding coral right in front of the resort! Walk out of your cottage, across the sand and start snorkeling. This is our 3rd consecutive time at Sau Bay because we love it so much. We've traveled to Fiji more than 10 times, and visited several resorts. Once we discovered Sau Bay there was no need to go anywhere else. Our best recommendation is that we're already planning to go back there again in 2018! The staff at this hotel was fantastic. Truly second to none. It's unfortunate when the owner is the weakest link. After 4 months of communication simple requests were forgotten; ranging from bedding configuration to diving requests. Simple things considering we were 4 of 6 guests. Upon checkin in we were welcomed with a large ' surprise' in the toilet covered in flies. Indicating that the room either wasn't cleaned or wasn't checked before we got there. The food was drastically overpriced. With no drinks $1300usd for vegetable sandwiches for lunch for 2 ppl for a 3 day stay. We also arranged transport through the resort, the taxi did not show up to the pier causing us to almost miss our flight back. 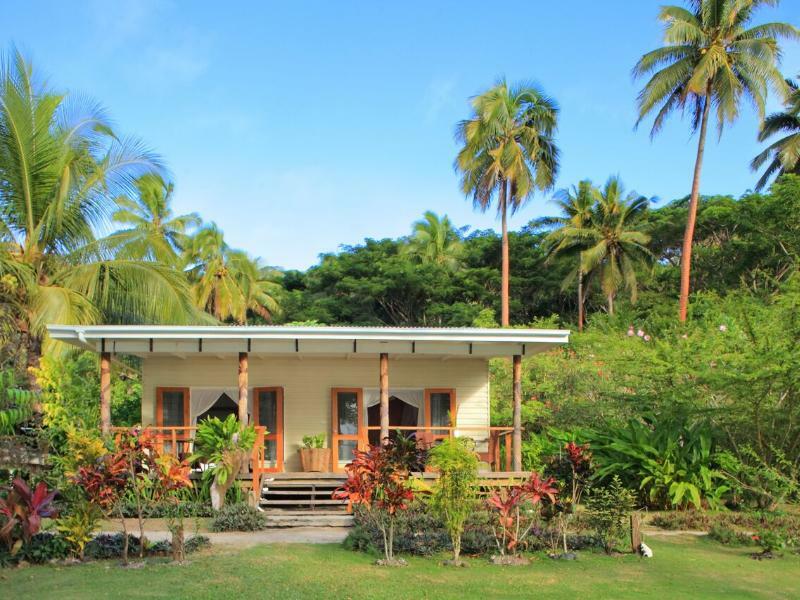 Unless or until the owner has a stronger presence and attention to detail, I would highly recommend saving yourself the hassle and money and stay on taveuni. Sau Bay was a beautiful place until we met the owner. She would come around the dinner tables every night and ask people what activities they would be doing the next day giving us the impression that there was pressure for us to spend money doing activities. We went on one of their complimentary activities and decided to charge us for it. We also found that there was no flexibility or comprimise with the owner and she was incredibly offensive when we had to confront her about the issues we had with her. All in all the place was great, staff were friendly and food was great but the owner seemed money hungry and made us feel incredibly uncomfortable when she was in our prsence which was not what we wanted on our honeymoon. I would not recommend this place to my friends solely due to the actions of the owner. Wir hatten eine tolle Zeit mit den besten Tauchgängen auf Fiji, mit einem sehr professionelle m Tauchguide, White Wall und Rainbow Reed bleiben unvergesslich, auch das tolle Ressort mit dem sehr freundlichen und aufmerksamen Personal und Nigel, der Hausherr hat sich sehr fürsorglich um uns gekümmert und wir haben entspannte Abende mit ihm und den "Haushunden" auf der Veranda nach leckerem Abendessen verbracht! Insgesamt eine rundherum tolle Zeit dort und Empfehlung für jeden, der kein großes Hotel mit nervender Abend Unterhaltung sucht.